Your cardiologist may recommend Cardiac Rehabilitation to help you return to the highest level of activity and independence possible. Cardiac Rehab is tailored to meet each individual’s needs. Active involvement by you and your family is vital to your rehab success. All present and past cardiac rehab participants, their caregivers, and family members are encouraged to attend monthly Cardiac Support Group meetings held in Frankfort and Traverse. These groups provide an opportunity to connect with other people who are living with the effects of cardiovascular disease. Participants can share their experiences, give and receive emotional support, and learn from each other. For more information about the Frankfort support group, contact Lorrell Guerra at 231-352-2203. For more information about the Traverse City support group, contact Jodi Radtke, BSN, RN-C, at 231-935-8560. 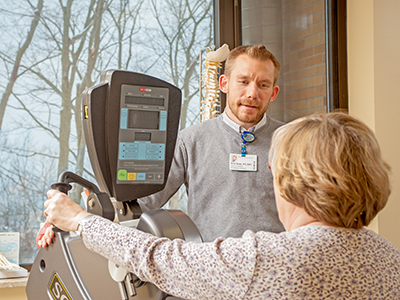 Phase II Cardiac Rehabilitation is an outpatient program that begins with a preliminary evaluation to determine your cardiovascular status. This heart-monitored exercise and education program takes place in a medically supervised group setting. Based on preliminary test results, specific exercises are prescribed during sessions held two to three times a week. Individual dietary, exercise and pharmacy counseling is also available. Click here for a list of apps for your smartphone that help you focus on improving your heart health.